From 2011-2014, FarmsReach collaborated with nonprofit, academic, and farmer partners to identify how we may best contribute to improving the quantity and quality of non-GMO, untreated seed purchased by production farmers. After a few years’ research and input from farmers, seed dealers and seed breeders, we were excited to “unveil” the Sustainable Seed Marketplace pilot at the Organic Seed Alliance conference, and we now invite your feedback. We welcome comments and feature requests from seed breeders, growers, dealers, and farmers across the country to guide the completion of this new, community-based marketplace. 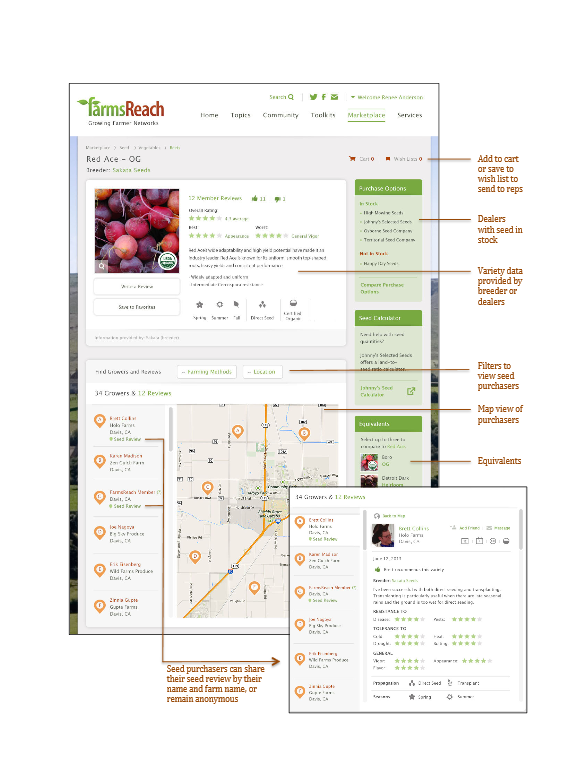 For updates and progress of the Sustainable Seed Marketplace, join FarmsReach. There are many obstacles and inefficiencies in the sustainable seed supply chain, which span the entire vertical – from breeders to growers to dealers to end-buyers. We are aware there have been several attempts to develop such a tool in the past, which is why we have taken the approach of engaging those who are much more experienced working with, developing, selling and purchasing seed to guide our software development. We created the architecture based on feedback from stakeholders – primarily farmers – across the seed supply chain. The pilot is the result of prototype testing since Spring 2013. This new Seed Sourcing Tool captures how farmers rate and review different seed varieties in different regions. Farmers can give a simple “thumbs up” or “thumbs down” for a variety, or provide detailed criteria ratings and a written review. They can also choose to share as much or as little information as they like, keeping their identity anonymous and saving personal detailed data for their own reference, if desired. While its core purpose is to make purchasing decisions easier for farmers buying seed, it is also intended to also support dealers and breeders in better serving the needs of production farmers. This can be accomplished by better communication and information flow between stakeholders. We know this is a disruptive, new system to buy seed, so we are starting small — with just five varieties to begin with, and in a finite geographic region for performance data. We expect there will be a learning curve for all of us involved in this initiative, so we will expand incrementally to gauge its success and ultimate effectiveness to build the market for non-GMO, untreated seed. To stay up-to-date on the Sustainable Seed Marketplace, please join FarmsReach. Top image courtesy of Organic Seed Alliance.